Wirnborne Minster just belongs to Dorset, being but a mile or two beyond the Hampshire border. 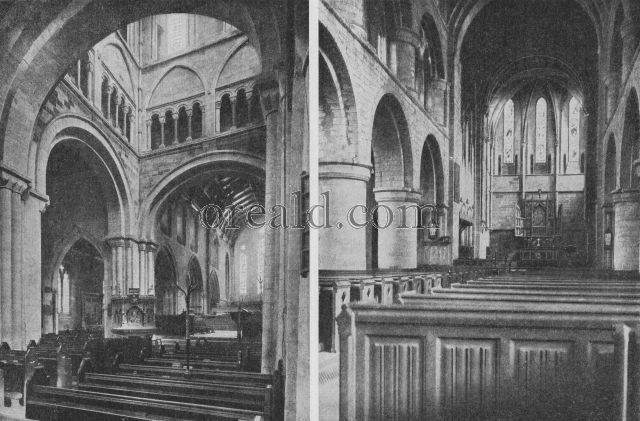 The photograph (left) shows the triforium which is one of the features of the interior of this famous old church, of which the central part dates from the 12th century. Many are the treasures of Wimborne: the orrery clock (on the north side of the west tower) that has been "going" since the 14th century, the Saxon altar table, 1100 years old, the almost priceless library of chained books. Where once stood a monastery in Saxon Shrewsbury remains the red sandstone abbey church (right) of Norman origin. Its Decorated west tower is impressive. Above the fine west window is a statue which is said to represent Edward III.